Singapore, 19 September 2011 – If it's true that we live in the era of the 'me' generation, then Grand Prix racing could be made just for them: Formula 1 really is all about number one, and the man who carries the tall thin digit on his Red Bull racing car is keen to add Singapore to his lengthening list of first-place finishes. "I love the track," says World Champion Sebastian Vettel. "It's very challenging, there are a lot of corners, it's very long, it's hot and it's a night race, so there are a lot of special things about Singapore." Most special of all, this year, is that a first Singapore victory to add to the 18 he has already achieved might even be enough to secure 24-year-old Seb's second successive world title. Last year he led the Championship standings after only one race – but it was the last one, in Abu Dhabi, and it made him the sport's youngest-ever number one. Another statistic in Sebastian's favour: this is the fourth street race of the year. Only one driver has won any of the previous three. 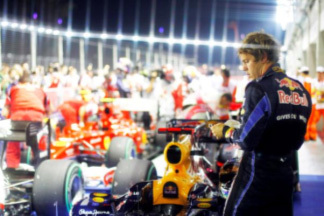 You guessed it, S. Vettel, winner in Melbourne, Monaco and Valencia – but Singapore might be the one that brings him undone. It will if Fernando Alonso has anything to do with it. Fernando is the man in Singapore: winner of the inaugural race in 2008, winner for Ferrari last year, third in `09, on pole last year, two fastest laps. No wonder F1's most lion-hearted driver has an ongoing love affair with the Lion City. "The Singapore circuit suits my driving style," he says simply, "in the way of me being very aggressive, going very close to the walls and trying to maximise the performance of the car in slow-speed corners. And you need to attack and be aggressive in the driving style so this is something that I love." While Vettel chases Championship glory, two-time title-winner Alonso is making history of his own. His sole victory of 2011 so far in the British Grand Prix was the 27th of his career. Should he win for a third time here, then Fernando would go past Scotland's Sir Jackie Stewart into fifth place on the all-time F1 winners' list. Only Michael Schumacher (91), Alain Prost (51), Ayrton Senna (41) and Nigel Mansell (31) would be ahead of the 30-year-old Spaniard. Thanks to the more generous points system introduced in 2010, that Silverstone victory also made Alonso only the second man in World Championship history (after Schumacher) to amass more than 1000 points – 1001 so far, to be precise, but 252 last year and 172 so far in 2011 have skewed his record in comparison with previous greats of the sport. Alarmingly for the rest of the field, Vettel's personal assault on the record-books continues apace. At just 24 he has 18 wins and is in the top 14 already; with 25 pole positions – although none in Singapore so far – he has only seven drivers ahead of him. He has a chance to become the single-season record-holder if he can take pole in five of the last six races of the year – he has 10 so far in 2011 and Nigel Mansell claimed 14 in 1992. Perhaps more tellingly, Vettel's astonishing 2011 record of only one finish outside the top two in 13 races so far has helped him to a career figure of 51 points-scoring results in 75 starts, a 68% strike rate that already has him in the all-time top three. At the other end of the F1 spectrum, Switzerland's Sébastien Buemi reaches his 50-race landmark in Singapore at the weekend, while first-timers on the Marina Bay streets are Pastor Maldonado of Williams, Force India's Paul di Resta and Mexican Sergio Perez. Like Singapore itself, the Marina Bay circuit has many faces – at least two of which are familiar to the only other driver to have won here, Lewis Hamilton. "It's almost two tracks in one," says the 2009 Singapore winner. "There are quite a few fast corners, which require good set-up and a bit of commitment, but there are also lots of tighter 90-degree bends, which are slower and more technical. You've got to keep it precise through these and just be patient, waiting for the tyres to bite before getting on the throttle." Tyres and throttles have been two of the most talked-about features of this F1 season, with new supplier Pirelli spicing up the mixture with its range of tyres and mechanical features like DRS making for some spectacular overtaking. Pirelli will confront the Marina Bay challenge with its 'Soft' and ' Super-Soft' options. DRS means Drag Reduction System, a high-falutin' term for an essentially simple device which allows the driver to open a gap in his rear wing, reduce the 'drag' on his car and thus make it go like a bat out of you-know-where long enough to get past the man in front. It can be deployed only under certain conditions in a race, but Hamilton's boss Martin Whitmarsh at McLaren thinks it will make quite a difference on the streets of Singapore. "The addition of DRS means that we should expect some truly electrifying racing this weekend," says the McLaren team principal. "The track is wide enough to support close and exciting wheel-to-wheel racing and I sincerely hope that's what we see this weekend." Going fast is all very well, but a Formula 1 car needs to stop quickly as well, a quality that Singapore stretches to the limit. Just ask Mercedes-Benz's Norbert Haug: "It is the toughest of the season for the brakes and gearbox," he says. "In the final sector alone the drivers must negotiate 10 corners in the space of 1500 metres and there is very little margin for error." Or, as Sauber's Kamui Kobayashi succinctly puts it, "Singapore is always very close to wall…"